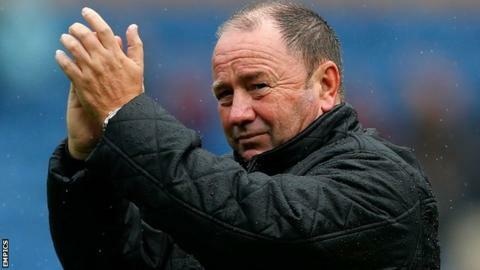 Manager Gary Johnson says Yeovil Town must "come back stronger" from their relegation from the Championship, which was all but confirmed on Monday. The Glovers' 2-1 defeat by Huddersfield left them six points from safety with two matches left, needing a 13-goal swing to stay up on goal difference. Johnson, who led the club to League One promotion last season told BBC Somerset: "The club's got to be bigger. "Going back to League One means we can regroup and come back stronger." Johnson was in charge in 2003 when non-league Yeovil were promoted to the Football League for the first time in their history. Ten years later, following spells in charge at Bristol City, Northampton and Peterborough, the 58-year-old had returned to the Glovers and engineered their rise to the second tier for the first time, with a win over Brentford in the play-off final at Wembley. Yeovil have one of the smallest budgets in the Championship and Johnson said at the start of the season he was aware of the challenge the club faced of staying in the league. They won their opening match of the campaign against Milwall but have only managed a further seven victories since then. "We hold our hands up when you're down there and relegated," Johnson added. "Obviously you're disappointed but at the same time we knew we were in a situation we had to enjoy, to celebrate every moment of promotion. "I felt we did that. I think our supporters have enjoyed the Championship. We have had to put in a lot of effort to get 37 points. "Although we are down we are looking at it philosophically. If we come up we have got to look at things bigger. "If not, we will end up where we should be, and if you look at the size of the club that will be in League Two or League One." Yeovil face Brighton on Friday in their penultimate game, before finishing the season at home to Middlesbrough.